Encourage kids to get outside and play with this Step2 Canopy Playhouse (that’s on sale on Amazon)! Hurry and get the Step2 All Around Playtime Patio with Canopy Playhouse today for $199.99 only $139.99 from Amazon! The reviews are amazing. I love that Step2 outdoor playhouses are made to last! Amazon Prime members get FREE 2-day (may take longer with ground transportation) shipping!! If you are not a Prime member, get FREE shipping when you purchase $25 or more of eligible items across any product category. There’s no end to the playhouse fun your little ones will have everywhere they turn when they’re in the All Around Playtime Patio with Canopy Playhouse by Step2! Covered by a wind-resistant, sun-protected, tent-like gazebo top, they’ll first walk through a wide swinging door, only to be immediately greeted by three sides of awesome activities. On one side of this playhouse for kids there’s a cool toy grill with clicking knobs, grids, lifting hood, and side sink. 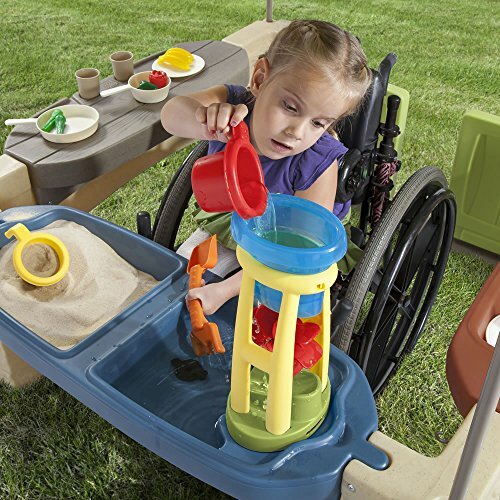 On another, there’s a dual sand and water play table with cover. And on the last, there’s a handy-dandy ledge that doubles as a cute snack table, buffet sideboard, or even lemonade stand! Fun accessory set included. So when you’re looking at playhouses for kids outdoor with a kids grill included, look no more! Made in the U.S.A. of U.S. and imported parts. Adult assembly required. Buy the Step2 All Around Playtime Patio with Canopy Playhouse from Amazon. Next articlePoopsie Surprise Unicorn (In-Stock)! Easter Baskets!